All of our Desiccator Cabinets and Dry Boxes are available in stock sizes or custom designs to fit your need. We provide moisture free storage in our STI Cabinets and Dry Boxes. Our products offer a clean room environment at a fraction of the cost. STI manufacturers multiple size Desiccator Cabinets and Dry Boxes as an alternative to the expensive PVC Plate material. Available with our exclusive permanent static dissipative coating, applied to the entire cabinet, it provides a permanent solution to potential ESD dangers. 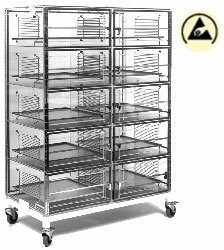 We offer Desiccator Cabinets and Dry Boxes in a variety of Adjustable Shelf Models and Tape and Reel configurations. 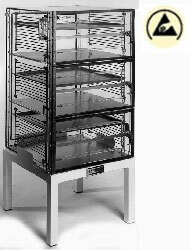 We design Desiccator Cabinets and Dry Boxes as stand alone cabinets, Pass-Thur models and small Test Fixture Modules. We will be most pleased to work with you on any of your Cabinet requirements. *Our "Plenum Wall" is required to maintain a constant even flow of N2 throughout our multi door Desiccator Cabinets. capabilities from our Single Door cabinets up to our largest Door cabinets. Using our STI Cabinets you can create and maintain an inert atmosphere of any concentration. They are ideal for tissue work when a controlled carbon dioxide atmosphere is required, or for flooding the chamber with nitrogen to eliminate oxygen. Our Desiccator Cabinets have Gas Regulator which can be turned off or regulated to control the amount of gas required for your process.